Countless well-wishers have offered words of encouragement to FC Bayern München defender Holger Badstuber in the wake of his latest injury. Get well soon, Holger Badstuber! 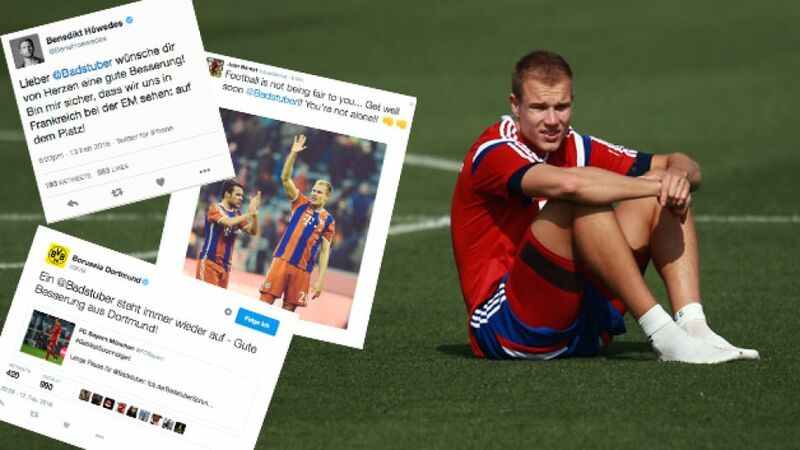 Following the shock news that FC Bayern München defender Holger Badstuber faces three months on the sidelines with an ankle injury sustained in training this weekend, countless messages of support have been sent to the 26-year-old on social media. bundesliga.com wishes the centre-back a speedy and healthy recovery, and rounds-up the well-wishes for the Germany international. "Because health is the most important thing: Get well soon, Holger! We hope you come back quickly!" "Get well soon, my friend. The trick is to always get up one more time than you're knocked down. You can do it!" "Get well soon, Holger. You've had to hear that phrase too much, but you'll do it again nevertheless." "All of Schalke hopes you get well soon!" "Dear Holger, I hope you get well soon with all my heart. I'm sure we'll see each other in France at EURO 2016 - out on the pitch!" "I'm so sorry Holger. Don't let your head drop, you'll come through this!" "I'm lost for words. Keep your head up, Holger! You'll come back from this setback too! Stay strong." "Get well soon my friend." "A Badstuber always gets back up again. Get well soon from Dortmund!"